Ganbare. To try one’s best, to work hard and do the best you can. A word that we as JET participants often heard the children we were teaching in Japan yell out in support of classmates atundokai or when entering into a high-stakes janken tournament to decide matters of great importance, such as who will get the last bottle of milk at lunch, or when encouraging a friend to have a go at reading aloud in English class the adventures of the characters from the textbook. To use the vernacular and simply say ganbare back to the children of Japan, as they face the biggest crisis they are likely to ever encounter, did not seem enough for the JET alumni in Victoria, Tasmania, and South Australia. We wanted to do more. As we watched the horrific scenes of destruction on television, we felt sadness. It was like watching our second home being destroyed and feeling powerless to help. So we banded together, mobilised quickly, and actively sought to show our support for Japan through various fundraising activities. We brought others along on our journey and are pleased to report what we have achieved so far. The first activity we organised, just weeks after the disaster, was a fundraising event held in March 2011. The event was called Anime in the Arvo and involved the screening of Japanese animation films in central Melbourne’s Federation Square. Through reaching out to our networks, we garnered support from the Melbourne International Film Festival (MIFF), who allowed us to screen MIFF films free of charge, and Federation Square which opened its prime event space for us. We recruited animators from local Japanese clubs and universities who sketched scenes in Federation Square which were made available for the public to purchase in exchange for a donation. Passersby were approached by the JETAA cosplayers for donations. Crowds gathered as a Japanese taiko (drum) group performed and demanded the attention of all in the vicinity. Our endless bucket-shaking paid off and we raised over 5,000 Australian dollars for the Red Cross Japan and Pacific Disaster 2011. 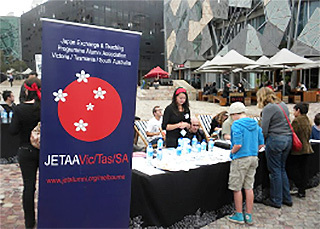 Smaller JETAA fundraising activities were arranged to align with other events that JETAA participated in, including the Japan Festival in both Melbourne and Adelaide and the Melbourne Marathon. Tasmania held a successful tsunami fundraiser which brought people together for the Japanese Film Festival. 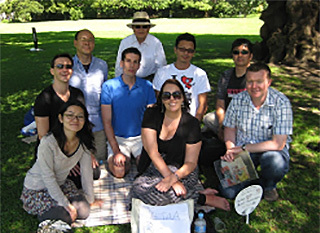 South Australia also participated in the Japan Earthquake Disaster Appeal Committee and a condolence service for victims of the earthquake disaster which was held in Elder Park, Adelaide. As the one-year anniversary of the disaster approached, we decided to organise a chapter-wide activity to commemorate the day and to raise much-needed funds to support continuing recovery efforts in Tohoku. Our JETAA chapter is unique in that it comprises a central chapter located in Victoria and two sub-chapters in Tasmania and South Australia. The geographical distance between sub-chapters means that we are rarely able to hold chapter-wide meetings or undertake activities together. However, we were able to meet as a chapter in December 2011 and came up with a new concept for fundraising. We decided that our fundraising efforts would improve if they did not rely on a single event. We felt that a more strategic method of fundraising would be to encourage our membership to work with JETAA to organise numerous fundraising activities across Australia. This would increase the reach of our mission and ultimately the number of donations received. 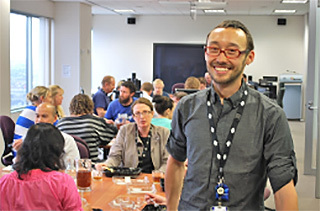 This lead to the birth of Big Bento Lunch, a project that involved JETAA members hosting Japanese lunches in their workplaces, schools, or with their families/friends during the week that coincided with the one-year anniversary of the disaster. In planning the activity we secured support and sponsorship from the Consulate-General of Japan in Melbourne, UNICEF, and a Japanese publishing company, Dengon Net. The committee developed a website to encourage members to join our cause, which was publicised through social media networks and the mainstream media. Numerous registrations were received via our website and lunches were hosted in every state and territory in Australia between 11-17 March, 2012. More than 60 organisations participated in the project, helping to raise more than 15,000 dollars. These funds were directed to the UNICEF Japan Earthquake and Tsunami Emergency Relief Appeal, the Japanese arm of the international charity actively working in Japan’s north-east region to support children in disaster affected areas, a cause close to the hearts of JET participants. Big Bento Lunch was held again in March 2013. Our chapter is proud that we have been able to successfully implement a chapter-wide fundraising activity this year. There is already talk of going national or even international with our fundraising next year. Japan’s recovery and reconstruction will be a long process, and Tohoku’s need for support will continue for years to come. Rest assured that JET alumni in Australia are here to support Japan. Japan gave us all so much, and we are absolutely committed to continuing to give back. Ganbare Japan! Most JET participants have very fond memories of their time in Japan, from the big occasions like graduation ceremony or climbing Mt. Fuji, to the smaller, everyday events such as watching taikodrumming, meeting friends in an izakaya, or choosing between odd flavours of Pocky in the supermarket. Evenings might be spent getting together to study for the JLPT once the pre-test panic kicks in, and then rounded off with a few choruses of My Sharona in a sweaty karaoke box. The Irish JET Alumni Association (IJET) cannot do much about bringing Mount Fuji or graduation day to Ireland, but in the past year it has been a real pleasure for us to echo all of those smaller moments for our members. Ireland has been a participant country on the JET Programme since 1988, and since that time more than 900 people have traveled from all parts of the country to the doors of the Keio Plaza Hotel for post-arrival orientation. 319 of those are now registered members of IJET and receive our e-mails about Japanese-themed cultural events, social gatherings, educational classes, and job opportunities in Ireland. Although the Japanese community in Ireland is quite small, it is correspondingly close-knit, and we have been able to jointly organise and promote events with many Japan-related organisations here. These include the Japanese Language Teachers of Ireland, the Ireland-Japan Association, the Japan Foundation, the Japan Social Group, and the Japanese societies of Trinity College, Dublin City University, University College Dublin, and the Institute of Technology Blanchardstown. 2011 started off with a table quiz about Japanese language and culture held in Messrs Maguire pub in Dublin, jointly run with the Japan-Ireland social group. Over 80 people attended and although the competition was high, the mix of Japanese and Irish players meant there was always someone on hand to ask for hints about that last member of SMAP or the Irish rugby squad. Winners received vouchers for a newly opened Japanese restaurant and runners up were awarded with grab-bags from the Asian supermarket (including all the Pocky flavours we could find). 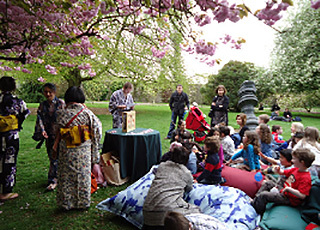 In April, IJET participated in Experience Japan Day, an annual event held in Farmleigh House in the Phoenix Park and sponsored by the Dublin City Council. The day aims to introduce Japanese culture – both traditional and modern – to the wider public, and includes taiko drumming,yakisoba and takoyaki stalls, and a cosplay competition. 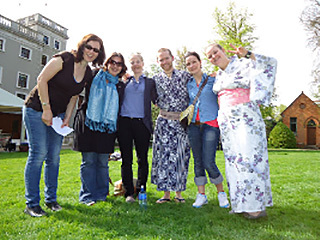 IJET members helped to MC a demonstration on how to wear kimono and dressed visitors in kimono and yukata afterwards. 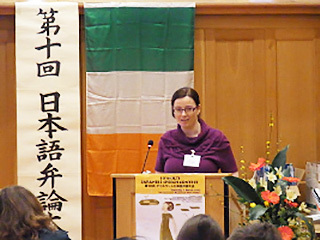 Another annual event is the Japanese Speech Contest organised by the Japanese Language Teachers of Ireland. This is now in its tenth year and has different categories for school student, beginner, intermediate, and advanced levels. There is always a good smattering of JET alumni at the contest, and IJET awards a special prize to the best speaker. In 2011, the IJET prize went to Richie Kirwan, who also won the great overall prize of a return ticket to Japan. The standard of speakers at the contest is always high, and we hope it is partly due to our Japanese language lessons for JET alumni. 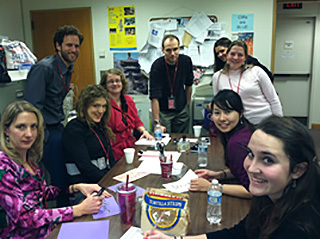 These are held for four weeks in November and concentrate on preparation for all levels of the JLPT. We’re greatly assisted in this by the Japan Foundation, which has a representative in Ireland who leads the classes. 12 JET alumni attended the classes this year, and because so many were interested in continuing the classes after the exam, IJET now organises an informal language class once a month. Other events IJET has organised over the past year include a karaoke party and meet-up in the newly opened Japanese-style izakaya in Dublin, where the korokke and yakitori went down particularly well. We arranged to meet in advance of screenings at the Japanese Film Festival, and the recent Kodo concert in the National Concert Hall. Plans for the future include another Shatta Chansu event, where teams of Japanese and Irish people follow a trail of clues and special challenges all over Dublin and race to be the first ones back. Teaching the doorman at Brown Thomas to say Irasshaimase and getting up close and personal with Hello Kitty were particular highlights of last year, so we’re looking forward to doing it again. Of course, 2011 was very much dominated by the tragic earthquake and tsunami of 11 March, and there was a huge response from JET alumni, along with the wider Irish public, to the disaster. A group of Japanese university students, many with families in the Tohoku region, set up a group called Aid Japan (Dublin) to collect both messages of hope and condolence and monetary donations for the victims. IJET members volunteered with this group and helped collect hundreds of messages, which were subsequently sent to Sendai City Hall. In October, I attended the JETAA International Meeting in Tokyo and afterwards volunteered with the ongoing clean-up operation in Rikuzentakata City, Iwate Prefecture. 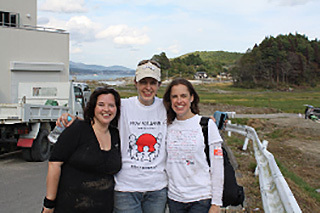 It was of course a deeply affecting and upsetting experience, but it was a privilege to be doing something – however tiny – to help the people of Japan. It was also wonderful to meet Irish JET participants based in other prefectures who regularly came to the region to volunteer. The response to the disasters has really demonstrated the depth and strength of the links JET participants have with Japan. It is one of the reasons IJET is so proud to help with the ongoing development and support of the JET Programme, from promotion to preparing outgoing JET participants before they depart for Japan. All JET alumni and their family and friends are welcome at our events, and we would love to see you there. We would also really like to expand outside the Dublin area and hold events and meetings across the country. If you have any ideas please do get in touch via our website or by e-mail at: jetaaireland[@]gmail.com. Susan was an ALT in Tokushima Prefecture from 2010 to 2011 and now lives in the Washington, D.C. area. There she interns at the African Wildlife Foundation and works with other recently returned JET participants as a temp for the JET Programme office at the Embassy of Japan. When the time came to plan my departure from Tokushima Prefecture on rural Shikoku, I did as little as possible to disrupt my last few months of the expat dream-life. I packed my bags, closed my bank account, and purged my apartment of the dusty artifacts of decades of ALTs, but I ensured that the number of job hunting hours I logged was zero. Instead of preparing for home, I moved to a friend’s apartment and revelled in the sweet life of a JET Programme retiree: late mornings, lunches with co-workers, aikido practice, and train station shopping. 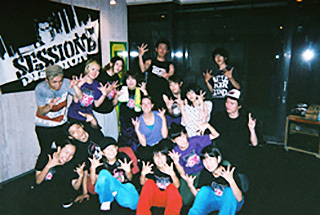 I travelled through Kyushu and busted my final house dance movies with the neon-clad twenty-somethings at my local dance studio. I did all of this to preserve the precious final moments of a realised dream, fully aware of the uncertainty that awaited me in the recession-riddled United States. I knew that I had no plan, and that making the most of my time would have repercussions. But as I backpacked from beach to volcano to sleepy village, those repercussions seemed as far away as the country to which I would return. You see, I was one of those JET participants who went straight from the bubble of kegs, term-papers, and rainy day slip ‘n’ slides to the gaikokujin bubble of Japan. The JET Programme was my first full-time job, and it was as far forward in my career as I had ever actually envisioned with any clarity. The rest was vague, elusive, and to be worked out later. Once I set foot on American soil, however, the sedative of self-deception began to wear off. As I received an angry, senseless, how-could-anyone-have-this-much-energy-to-yell-at-five-a.m. reception from the the airport security personnel, I suddenly collided with the America I had left behind. My jet-lagged self did not realise this at the time, but the irate airport security personnel were symbols of a world that had moved on without me. While I had been abroad, my sister had given birth to twins, my parents had sold our house, and I had been out of physical touch with my boyfriend for over a year. My life had become so unrecognisable that I did not know everyone in my family, or even where I lived. It took me about a month to absorb all of the changes, and to settle into being an aunt, a girlfriend, and an aspiring young professional. I would have been content to continue this “absorption” process for a little while longer, but (luckily for me) my boyfriend initiated the change that brought me out of my parents’ house – where trading an hour of job searching for on hour of baby-time was all too easy – and into Washington, D.C. Here, no one my age considers pausing to “absorb”. Here, networking happy hours and overcharged political opinions reign supreme, and here I could no longer escape my quest. It was like heaven to be living with my boyfriend after a year of Skype dating, but the first few weeks in D.C. were also an exercise in tough love. During the day, the entire world marched importantly off to work, leaving me at home to grapple with the task of job hunting. The digital universe of a job seeker is filled with black holes. They wait to consume the careful cover letters sent via e-mail, while job boards transform any productive day into a day filled with aching eyes and a vitamin D deficiency. It is a universe filled with non-responses, cancelled interviews, and networking coffee sessions, all in competition for a low-paying, entry-level position. Stumbling through the process, I became depressed and sluggish, unable to make the most of all of the free time I had during the day. I actually did my first phone interview – at one p.m. – in my pyjamas. But before you reach for the vodka or ice cream, I will let you know that this is where JETAA stepped in and saved me from my impending self-implosion. In mid-November, I joined a group of other recently returned JET alumni, friends of alumni, and Japanese people living in D.C., who became the temporary application processing staff at the JET Programme office of the Embassy of Japan. From the first morning, which began with an enthusiastic ohayo gozaimasu, I felt rejuvenated. It was exactly what I needed – something to force me out of the house everyday and something to act as a bridge between Japan and my new D.C. life. We spent months stapling, collating, and organising applications for the next year’s new JET participants, but also reminiscing about Japan and commiserating with one another about the horrors of job hunting in a recession. For example, Rianna Jones, an Osaka ALT, travelled all of the way from D.C. to Boston for the Boston Career Forum, expecting to find opportunities in the United States for English and Japanese bilinguals. Instead, she found herself to be one of a handful of Americans in a sea of Japanese finding jobs for native speakers in Japan. She maintains a positive attitude and says that the trip was still worth it, but her story is an example of the many trials that make up a job search. For most people in these economic times, finding a job is scary, overwhelming, and takes an excruciatingly long time. This is tough for anyone to deal with, but for JET alumni it can be even tougher: by the time I returned home from Japan, my friends had already been through their months of misery and landed jobs. At first it shook my confidence to watch my friends move forward in their careers without me, but now I realise that we JET alumni have something incredibly special: each other. The friends I have made through the JET Programme office understand exactly what I am going through. They have supported me, networking happy hour-ed with me, and proven vital to my sanity. That is why they are the moral of this story – no JET alumnus should have to job hunt alone. In recent years, Fiji, Samoa, Palao, and Tonga were added to the list of participating countries on the JET Programme. In this section, JET participants from two of these island nations, Fiji and Tonga, provide photographic glimpses of their experience as JET participants in the island nation of Japan. JETAA International is a committee made up of elected officers and 20 JETAA country representatives. JETAA International provides a central point of communication, facilitates the exchange of resources, knowledge, and talent, and helps promote the JET Programme and JETAA chapters around the world. Click here to visit the JETAA International website. There are currently 52 regional JET Alumni Associtation (JETAA) chapters located in 15 countries/regions. (Click here for a list of JETAA chapter websites.) JETAA International provides the following information for JET alumni looking to start a new JETAA chapter. Get in touch with JETAA International, and they will talk you through the process of starting a chapter. Also, it might be the case that there is already a chapter in your area that you did not know about. Enquiries about starting a chapter should be directed to the Vice Chair at: jetaainternationalvicechair[@]gmail.com. This can be accomplished with the help of your local Japanese Embassy or Consulate General, or by word of mouth and the use of social media. Your local CLAIR office may also be able to help. Japanese cultural events – ikebana, hanami, tea ceremony, sushi-making, etc. JETAA International is the umbrella organisation for JETAA chapters. Once you have gathered 20 chapter members, you can apply to JETAA International to become a member. In addition to providing a membership list, you will need to provide a summary of activities and events conducted over the last 12 months and create chapter by-laws. Membership in JETAA International means that you can participate in international and regional meetings with other chapter chairs, use the JETAA logo, access resources and advice, and network with other chapters and members. The JETAA International website is a good place to start. JETAA International is currently working on gathering resouces for the website, including advice on accessing funding, chapter newsletters, templates for planning events, event brochures, and pre-departure guides. From the website, you can also access JETAA chapter websites and social networking sites around the world. The JETAA section of the JET Programme website also contains a list of JETAA chapter websites. JETAA International can host your website, but you will need someone to create the website before we can upload it. This all may sound like a lot to do, but JETAA International can help every step of the way. JETAA International is dedicated to helping JET alumni set up new JETAA chapters across the world and is eager to hear from JET alumni. The following is a message from the Kanagawa Prefectural Government. Hello, everyone. This is a message from the Kanagawa Prefectural Government, Japan. Do you know Kanagawa Prefecture? Kanagawa is located next to Tokyo. There is a variety of attractive cities and towns in the Prefecture, such as Yokohama, a gateway to Japan, Hakone, a hot-spring resort near Mt. Fuji, and Kamakura, the old Shogunate capital. Last year, the Kanagawa Prefectural Government established the Kanagawa International Fan Club. The Club is a network of foreign people who are familiar with Kanagawa, such as those who are studying in the prefecture. Through the Club, we aim to establish a network to link Kanagawa with the world, send out and exchange information on the attractive features of Kanagawa, and promote exchange with foreign nationals who have ties to Kanagawa. Why don’t you join the Club? Anyone who has worked in Kanagawa, has interest in Kanagawa, or is familiar with or has a connection to Kanagawa is eligible for membership. Even if you currently reside outside of Japan, you are welcome to join if you have studied or lived in Kanagawa or have interest in the Prefecture and the Club. Members will receive monthly e-mail newsletters carrying the latest topics on tourism, seasonal highlights and festivals, and the Prefectural Government’s distinctive measures and policies. No admission or annual membership fee is required for membership registration. Please access the website below and register for the Club online. Greetings from the Department of JET Programme Management at CLAIR. The Department of JET Programme Management issues JET Streams to JET alumni as a means for alumni to share their memories and experiences, and also to promote the strengthening of ties between JET alumni and Japan. We would like to thank all contributors to this edition of JET Streams. JET Streams is sent to JET alumni who have requested to receive it. We encourage JET alumni to sign up to receive JET Streams and to keep their contact details up to date with CLAIR. Instructions on how to do so can be found here. Also, past editions of JET Streams can be accessed here. JETAA currently has 52 chapters in 17 countries and regions and over 25,000 members. CLAIR would like to thank the JETAA chapters for the resouces they provide to newly returned JET participants, the role they play in international exchange between Japan and JET Programme participant countries, and for the tremendous financial and emotional support they sent (and continue to send) to Japan in the aftermath of the Great East Japan Earthquake of March 2011. In the 2013-13 JET Programme year, there are 4360 JET participants from 40 different countries. In 2013-14, the JET Programme will welcome approximately 1500 new JET participants, and the total number of JET participants for the year is expected to exceed 4360. In December 2012, CLAIR created an official JET Programme Facebook page to be used mainly to assist in the dissemination of JET Programme-related information to current JET participants and contracting organisations. Although most of the information posted to the page is intended for current JET participants, we encourage JET alumni to view and like the page. Also, please take a moment to look through the photos of scenery in Japan provided by current JET participants for the Facebook page.